Workers emerge from a building after a deadly shooting at the Washington Navy Yard on Monday. There are multiple injuries and deaths, and one gunman is dead. Police say they are searching for two other "potential" shooters. 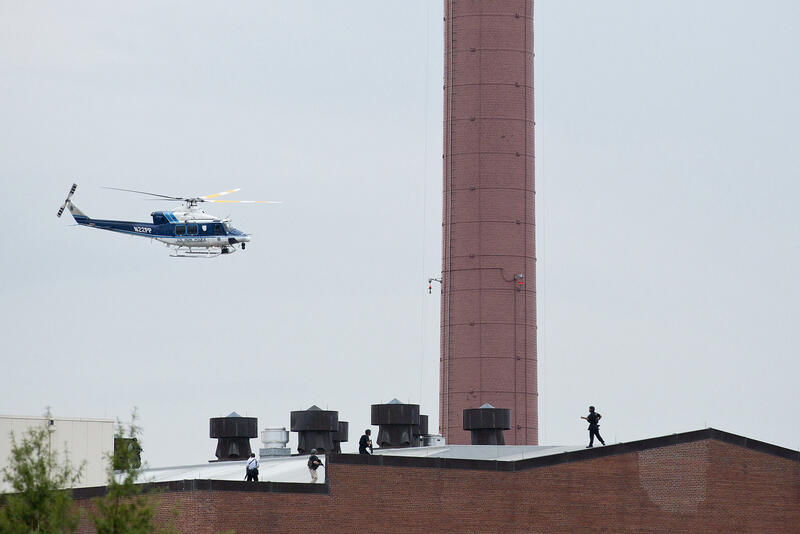 A police helicopter flies overhead as officers walk on the roof of a building. 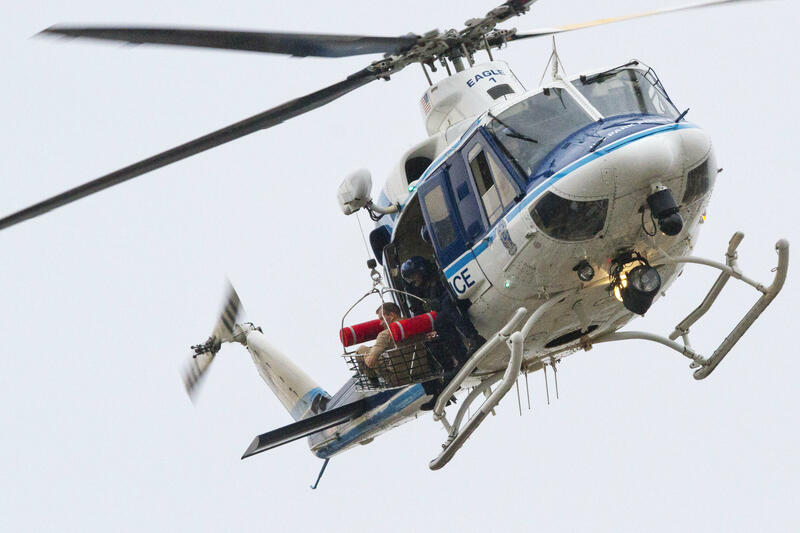 A Park Police helicopter removes a man from the scene of the shooting. Workers emerge from a building after a deadly shooting at the Navy Yard. Alexis's motive is still uncertain but, D.C. Mayor Vincent Gray said in a press conference that there is "no reason to suspect terrorism." A military guard stands at the scene of the shooting. Shots were fired at around 8:20 a.m. ET. 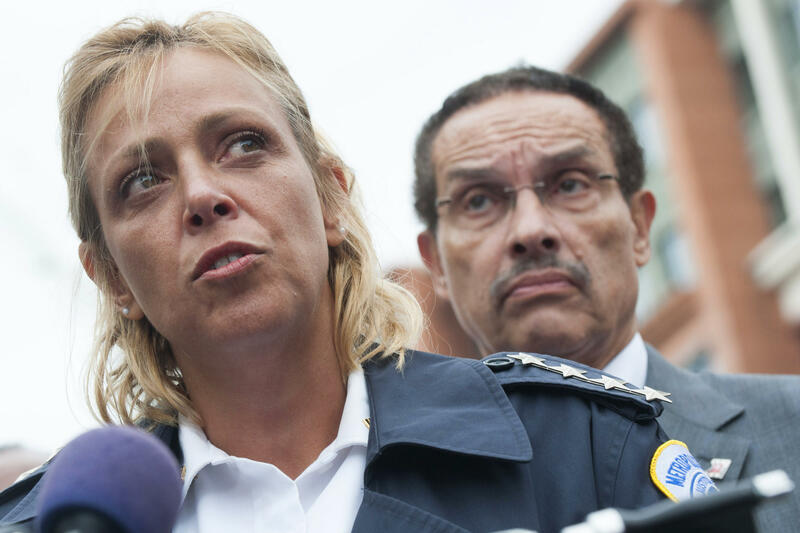 Washington, D.C., Police Chief Cathy Lanier and Mayor Vincent Gray speak to the media. 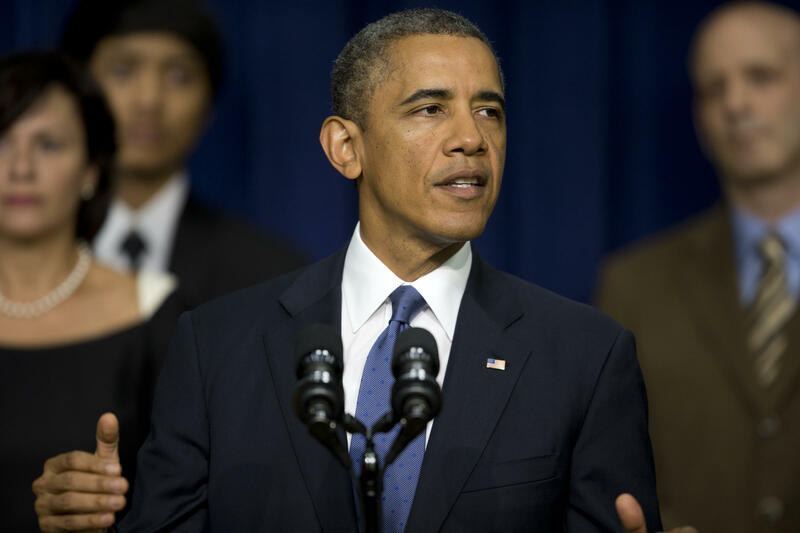 President Obama said the federal government will do all it can to ensure that "whoever carried out this cowardly act is held responsible." 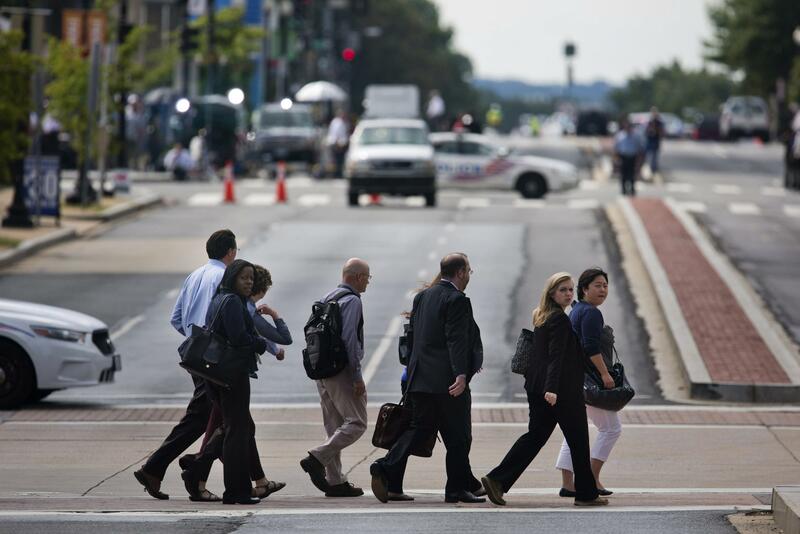 Office workers, who had been under lock down since the shootings this morning, leave the area around the Washington Navy Yard on Monday in Washington, D.C. Thirteen people were killed, including the suspected gunman, and several were wounded. 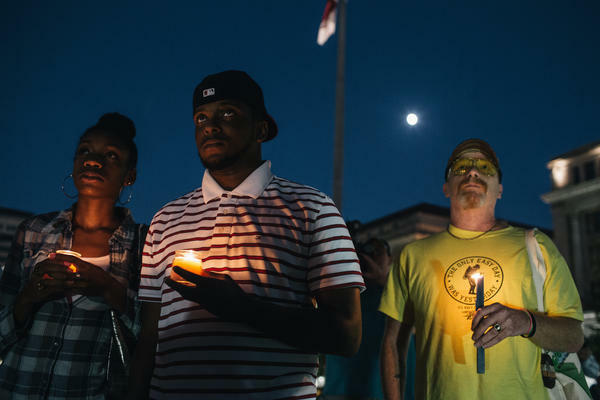 Brittany Carter, of Bowie, MD., (left) Jibri Johnson, of Landon, MD., (center) and Bryan Beard of Washington D.C. hold candles in remembrance of the 12 victims killed in a shooting at the Washington Navy Yard earlier in the day. 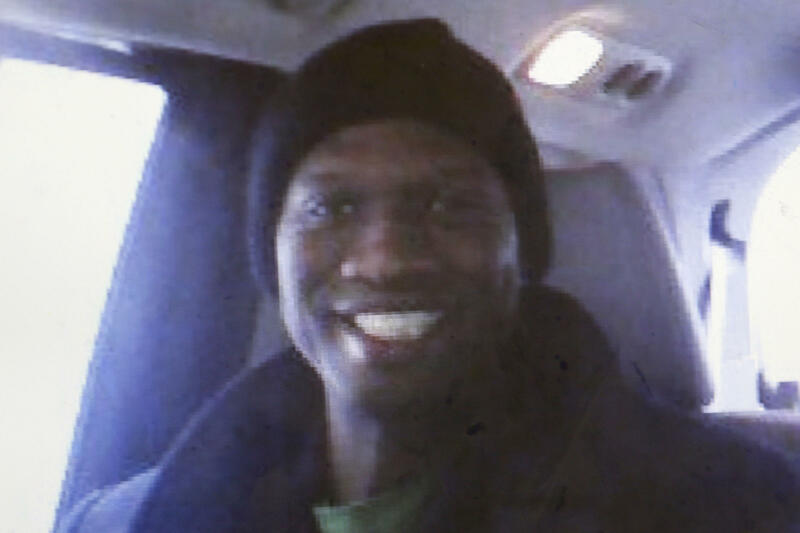 This undated cell phone photo provided shows a smiling Aaron Alexis in Fort Worth, Texas. Police monitor the area near the Navy Yard. The nation's capital went on high alert Monday after a shooting attack at the city's U.S. Navy Yard left at least 12 victims and one gunman dead and injured 8 others. Police said one suspected shooter was dead at the scene. By day's end, authorities were saying they did not think there had been a second shooter — as some evidence had earlier led them to believe. Authorities identified the dead suspect as Aaron Alexis, a 34-year-old man from New York, who the Pentagon says was a full-time Navy reservist from May of 2007 through January of 2011. NPR's Carrie Johnson reports that law enforcement officials believe Alexis gained access to the secure military facility by using the ID of "a 50-odd year-old African American man who was recently dismissed from his job at the Navy Yard." Alexis, however, was also working as for an IT company that was upgrading the Navy's computer system. D.C. Police Chief Cathy Lanier said it's still unclear how Alexis died, but she said he was involved in gun battles with active shooter teams inside building 197 of the Washington Navy Yard. Lanier said police had "multiple engagements with the suspect" and it was after one of those that Alexis was found dead. D.C. Mayor Vincent Gray said authorities did not suspect terrorism, but the motive for the shooting was still a mystery. The attack was, President Obama told the nation, a "cowardly act ... [on] men and women who were going to work, doing their jobs, protecting all of us." "They were patriots," he said of the victims. At first police officials said that there were two other "potential" shooters they were looking for. Other law enforcement sources, though, cautioned that in the confusion some first responders might have been mistaken for additional attackers. And just before 2:45 p.m. ET., D.C. Police announced that one of the potential other gunmen — "the white male in the tan outfit" — had been "identified and is not a suspect or person of interest." The incident began around 8:20 a.m. ET when shots were fired around a building on the grounds of the facility in Southeast D.C., the Navy confirmed just minutes later. Initially, there was word that only a few people had been injured and that only one gunman was responsible. Among those hurt, according to reports from emergency personnel, was a police officer who was struck at least twice. But at 10:04 a.m. ET, the Navy added that there had been "reports of fatalities." Federal law enforcement sources told NPR a short time later that there had been "multiple fatalities." Then as morning turned to afternoon, the death toll turned grim, when authorities said 12 victims were dead, not including the gunman. We're updating as more news comes in. Our colleagues at WAMU are following the story here. As happens when news such as this is breaking, there will be conflicting accounts. We'll focus on information from authorities in a position to know what's going on and from news outlets with reporters at or near the scene. If things change, we'll pass along that information. At a press conference just after 10 p.m. on Monday, D.C. Mayor Vincent Grey confirmed that 8 others were injured during the shooting, though not all were shot. Injuries ranged from gunshot wounds to head injuries sustained while fleeing the incident. Metro Police Department Chief Cathy Lanier said that their investigators had exhausted all means to eliminate a remaining suspect and that there is now no indication of a second gunman. Because of this, authorities are lifting shelter-in-place notice and residents could return home. FBI assistant director Valerie Parlave also confirmed that suspected gunman Aaron Alexis had a valid access pass for entering the Navy Yard complex. The names of the remaining victims will be released once all of the families have been notified. The Washington Post quotes The Experts CEO as saying that Alexis likely had a security clearance that gave him access to the Navy Yard. The Experts, where Alexis worked, is an IT company subcontracted by HP to refresh computer systems used on the Navy Marine Corps Intranet. "'Discharge from the military does not automatically disqualify a person from getting a job as a military contractor or a security clearance. It depends on what the circumstances are,' Hoshko said, adding that he and his co-workers are still reeling. Alexis received a general discharge. 'Obviously he was well-qualified. This really came out and shocked all of us.'" "President Obama has directed that flags be lowered to half-staff until sunset on Friday in honor of the victims of the #NavyYardShooting." "We are deeply saddened by today's tragic events at the Washington Navy Yard. Our thoughts and sympathies are with all those who have been affected. Aaron Alexis was an employee of a company called "The Experts," a subcontractor to an HP Enterprise Services contract to refresh equipment used on the Navy Marine Corps Intranet (NMCI) network. HP is cooperating fully with law enforcement as requested." In a televised press conference, D.C. Police Chief Cathy Lanier said people inside the Navy Yard complex are being asked to continue to shelter in place. This is because police are still trying to determine if a second person was involved in the shooting rampage. D.C. Mayor Vincent Gray corrected his earlier statement that the second person of interest was seen on surveillance video. He did say that they are still searching for a second suspect. "They died patriots; they died serving," Secretary of the Navy Ray Mabus said about the victims of today's rampage in an interview with CNN. Mabus said he did not know if Alexis had access to the Navy Yard. "At one point, he was a Navy contractor. Whether he was today, I don't know," Mabus told CNN. Our co-blogger Scott has added a post looking at what we know about Alexis. "Following his arrest, Alexis told detectives he perceived he had been 'mocked' by construction workers the morning of the incident and said they had 'disrespected him.' Alexis also claimed he had an anger-fueled 'blackout,' and could not remember firing his gun at the victims' vehicle until an hour after the incident. "Detectives later spoke with Alexis' father, who lived in New York at the time, who told police Alexis had anger management problems associated with PTSD, and that Alexis had been an active participant in rescue attempts on September 11th, 2001." The Tarrant County District Attorney released a statement about the 2010 arrest of Alexis. According to the DA, Alexis was accused of "recklessly" discharging a firearm "in the limits of a municipality." "It was determined that Alexis was cleaning a gun in his apartment when it accidentally went off," the DA said in a press release. No one was injured and authorities decided not to press charges. Initially we reported that suspected gunman Aaron Alexis was a 34-year-old from Texas. The FBI says Alexis was born in Queens, New York. Throughout his military career, however, Alexis was based in Illinois in 2007 and in Forth Worth, Texas, from 2008 to 2011. A Navy official tells NPR's Tom Bowman that Alexis received a general discharge in January of 2011 because of "misconduct issues." The rank of discharges, Tom tells us is, "honorable, general, other than honorable and dishonorable." Other details are still unclear, including what his job as a contractor entailed. 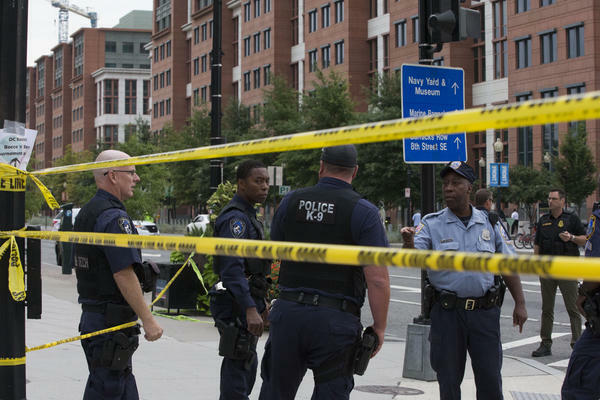 D.C. Police Chief Cathy Lanier said it's still unclear how the suspected gunman died, but that Alexis was involved in gun battles with active shooter teams inside building 197 on the Washington Navy Yard. In a televised news conference, Washington Mayor Vincent Gray said that police are still searching for a second person of interest, who was seen in a surveillance video wearing a drab olive uniform. Gray said it's still not clear whether that person was also shooting. As far as motive, Gray said that there is "no reason to suspect terrorism." "We don't know what the motive is," Gray added. Washington, D.C. Mayor Vincent Gray said one more person is dead, bringing the total dead to 12, plus the suspected shooter. Some good news from Washington Hospital Center: Three of the victims of the shooting have been upgraded from critical to stable. Two of them are still in surgery. Janis Orlowski, the hospital's chief medical officer, said all of them are expected to live. According to multiple federal sources, police believe the dead suspect is Aaron Alexis, who enlisted in the military May 2007 and left Jan 2011. Pentagon officials said he was an aviation electronics mate third class and was working as a contractor. As we reported earlier, Alexis is a 34-year-old Texas man, who police believe used another man's ID to gain access into the secure military facility. Alexis had a criminal record. The Washington Nationals, which play ball in a stadium right down the street from the Navy Yard, have postponed tonight's game against the Atlanta Braves. The team said it will be made up as "split doubleheader (1:05 p/7:05p) on Tue., Sept. 17." "The deceased suspected shooter is a 34-year-old Texas man who has a concealed carry permit," NPR's Carrie Johnson reports, citing a federal law enforcement source. The man has at least one "charge of unlawful discharge of a firearm," and has a law enforcement history. Carrie reports that the suspect was using the ID of "a 50-odd year old African American man who was recently dismissed from his job at the Navy Yard in order to gain access to the facility." That man, the source says, is now in custody as a person of interest. "The white male in the tan outfit has been identified and is not a suspect or person of interest," the D.C. Police Department just said on its Twitter page. Authorities are said to be still looking for a black male, 40-50 years old, about 5-feet 10-inches tall, with graying sideburns. He would be the other "potential" shooter that Chief Lanier spoke of earlier in the day. NBC News writes that "it was the deadliest mass shooting in the United States since the massacre at Sandy Hook Elementary School in Newtown, Conn., last December, and the worst at a military installation since 13 people were killed at Fort Hood, Texas, in 2009." The death toll is substantially higher than earlier reported. D.C. Police Chief Cathy Lanier says there are 12 people dead at the scene — 11 victims and one gunman. She also says police continue to look for two other potential gunmen. "We have multiple pieces of information that would suggest we have at least two other individuals who were seen with firearms," she tells reporters. Update at 2:05 p.m. ET. "Shelter In Place" Order Still In Effect. "Shelter in place order remains at Washington Navy Yard. More info to follow as confirmed. 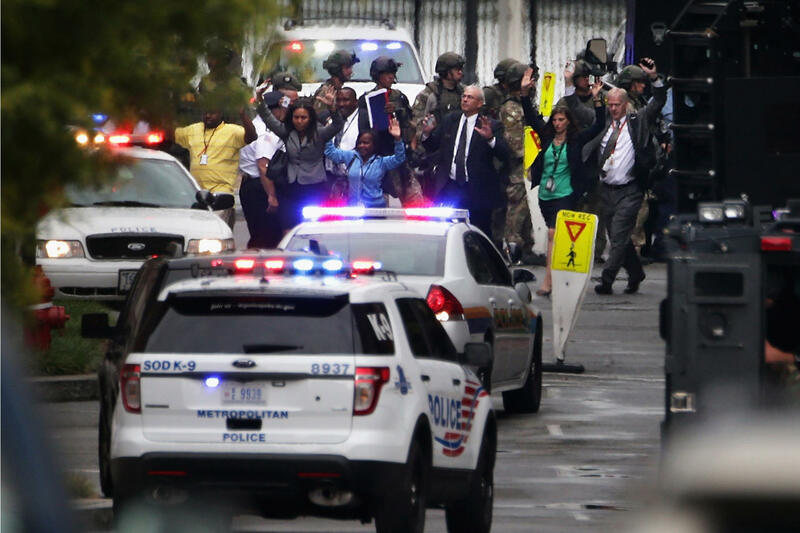 #NavyYardShooting"
While The Washington Post, Reuters and some other news outlets are reporting that seven people (including one gunman) are dead, there's no official word yet. The federal government will do all it can to be sure that "whoever carried out this cowardly act is held responsible," President Obama just said. The victims, said the president, were "men and women who were going to work, doing their jobs, protecting all of us. ... They were patriots." Police are on the lookout for two other potential "shooters," D.C. Police Chief Cathy Lanier just told reporters. One gunman, she said, is dead at the scene. Lanier described one of the potential shooters as a white male, possibly wearing a khaki Navy uniform, who was "last seen around 8:35 a.m" and may have been carrying a handgun. The other potential shooter, she said, is a "black male approximately 50 years of age" who "may have been in possession of a long gun." D.C. Police Chief Cathy Lanier and Mayor Vincent Gray are expected to brief reporters within the next few minutes. Hopefully, they'll be able to clear up some of the conflicting information in the news media over the past hour (including that there may have been more than one shooter and that at least one attacker may be dead). President Obama is also expected to soon make a statement. "We understand that there are individuals at the scene who will not be transported [to a hospital] because they are deceased," says Dr. Janis Orlowski of MedStar Washington Hospital Center. At the MedStar Washington Hospital Center, spokeswoman Dr. Janis Orlowski just told reporters that the three people brought there are in critical condition. They are expected to survive their gunshot wounds, she added. The Bureau of Alcohol, Tobacco, Firearms and Explosives has about "20 specially trained, locally stationed special agents" at the scene, NPR's Carrie Johnson reports. She says it's the same team that was instrumental in capturing accused Boston Marathon bomber Dzhokhar Tsarnaev. Two federal law enforcement sources, who caution that the information is still preliminary, tell NPR's Carrie Johnson that there have "multiple fatalities." We're aware that other news outlets have reported that their may have been more than one shooter. But there have not been any official statements to that effect. Emergency personnel have spoken on their radio broadcasts of a "possible" second suspect in the building. As you would expect, police are sweeping the building. Earlier, there were reports of a gunman barricaded in a room. There's also no official word yet on the number of people injured and possibly killed. The latest statement from the Navy repeats that "several people were injured and there are reports of fatalities." Update at 10:32 a.m. ET. "A Lot Of Criticals." Sobering news from the emergency personnel radio traffic: "We have a lot of criticals." The Washington Airports Authority "says the ground stop that had been in effect at Reagan National has now been lifted," NPR's Brian Naylor tells us. "The president has been briefed several times about the unfolding situation at the Washington Navy Yard by Assistant to the President for Homeland Security and Counterterrorism Lisa Monaco and Deputy Chief of Staff Alyssa Mastromanaco," the White House says. NPR's Brian Naylor tells us that "according to the Washington Metropolitan Airports Authority, the FAA has requested a stop on all outbound flights from Reagan National. Inbound flights are still landing, and the airport is open. But no planes are taking off." Flights into the nearby Reagan National Airport are on hold, and flights on the ground are behind held. There are a lot of helicopters in the air around the Navy Yard, as you might imagine. Update at 9:40 a.m. ET. Gunman Barricaded In Room? 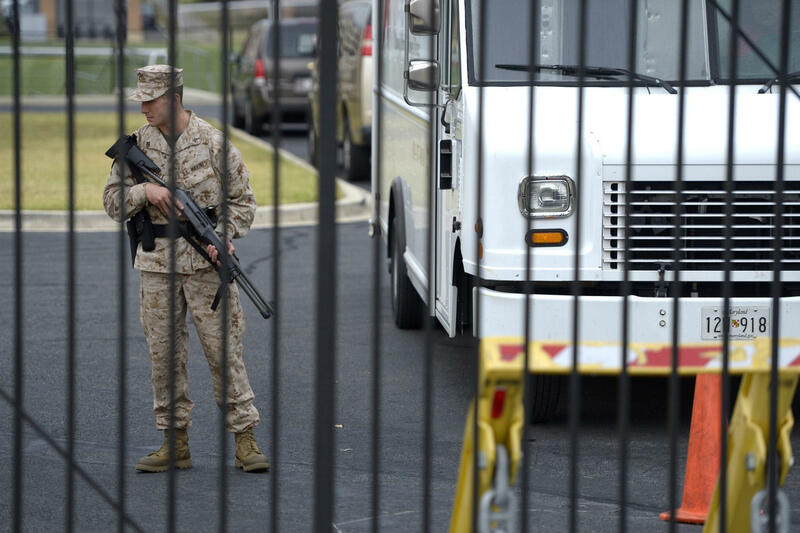 "Police: Lone gunman has barricaded himself in room after shooting http://wapo.st/149NSPY #NavyYardShooting." According to WAMU, "a possible suspect armed with a shotgun or rifle has shot and injured at least four people. A police officer has also been reportedly shot." D.C. emergency personnel have been heard on their radio calls saying that a police officer was "struck twice in the leg." Update at 9:25 a.m. ET. Report: "At Least Three People" Shot. "D.C. police are looking for a suspect they say shot at least three people at the Washington Navy Yard," The Washington Post writes. There's a live stream of fire and emergency personnel's radio calls here. The Navy tweets that it "confirms 1 injury. "Shelter in place" order issued for Navy Yard personnel. #NavyYardShooting." Washington's News Channel 8 live coverage is streaming here. Update at 9:01 a.m. ET. About The Building Where The Shooting Has Occurred. WASHINGTON (NNS) — An active shooter was reported inside the Naval Sea Systems Command Headquarters building (Bldg. 197) on the Washington Navy Yard at 8:20 a.m. (Eastern Time). There is one confirmed injury. Emergency personnel are on scene and a "shelter in place" order has been issued for Navy Yard personnel. The Naval Sea Systems Command's headquarters is the work place for about 3,000 people. The organization is comprised of command staff, headquarters directorates, affiliated Program Executive Offices (PEOs) and numerous field activities. Together, we engineer, build, buy and maintain ships, submarines and combat systems that meet the Fleet's current and future operational requirements. Naval Sea Systems Command (NAVSEA) is the largest of the Navy's five system commands. With a fiscal year budget of nearly $30 billion, NAVSEA accounts for one quarter of the Navy's entire budget. With a force of 60,000 civilian, military and contract support personnel, NAVSEA engineers, builds, buys and maintains the Navy's ships and submarines and their combat systems.